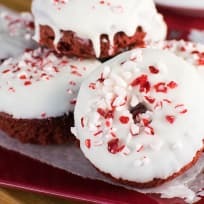 Red velvet peppermint donuts are super festive and fun for the holidays. We’re thinking Christmas day breakfast right here. Red velvet fudge to make your valentine squee. Aren't they beautiful little bites of bliss?! Red Velvet Crème Brûlée is a whole new way to enjoy decadent red velvet flavors. One crack into that crispy top and you'll be head over heels. Red velvet waffles full of rich cocoa flavor - that can be made with regular flour or gluten free. Whip them up for breakfast this weekend or on Valentine's Day! Cheesecake Factory Red Velvet Cheesecake is one of the most decadent things on their menu. Now you can make it at home! 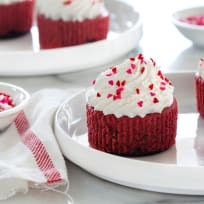 These Red Velvet Cookies are so simple to make and are the perfect chewy cookie with all the red velvet flavor you love. Perfect for cookie swaps! 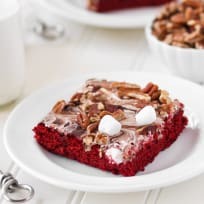 Red Velvet Cheesecake Brownies are a delicious dessert treat, ideal for Valentine's Day - or any day, really. 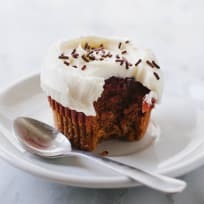 Read on for our easy recipe.